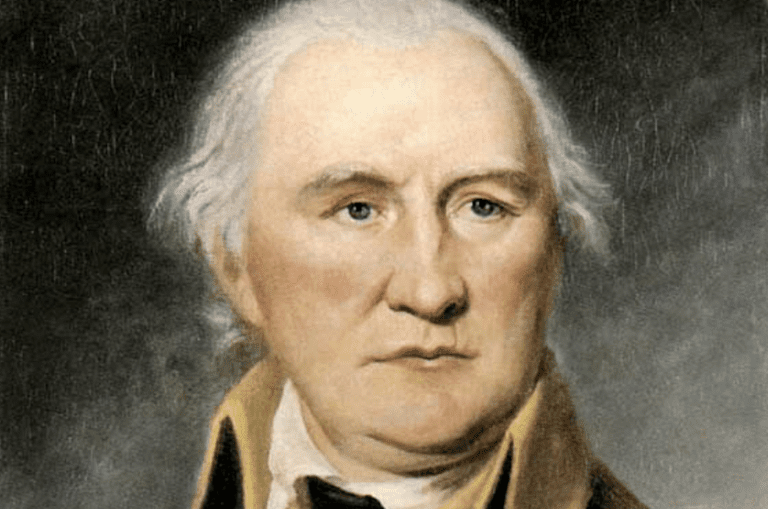 Daniel Morgan (July 6, 1736–July 6, 1802) rose from humble beginnings to become one of the Continental Army's finest tacticians and leaders. The son of Welsh immigrants, he initially saw service in the French and Indian War as a teamster before putting his marksmanship skills to use as a colonial ranger. With the beginning of the American Revolution, Morgan assumed command of a rifle company and soon saw action outside of Boston and during the invasion of Canada. In 1777, he and his men played a key role at the Battle of Saratoga. Known For: As a leader of the Continental Army, Morgan led the Americans to victory during the Revolutionary War. Born on July 6, 1736, Daniel Morgan was the fifth child of James and Eleanor Morgan. Of Welsh extraction, he is believed to have been born in Lebanon Township, Hunterdon County, New Jersey. He left home around 1753 after a bitter argument with his father. Crossing into Pennsylvania, Morgan initially worked around Carlisle before moving down the Great Wagon Road to Charles Town, Virginia. An avid drinker and fighter, he was employed in various trades in the Shenandoah Valley before beginning a career as a teamster. With the beginning of the French and Indian War, Morgan found employment as a teamster for the British Army. In 1755, he and his cousin, Daniel Boone, took part in Major General Edward Braddock's ill-fated campaign against Fort Duquesne which ended in a stunning defeat at the Battle of the Monongahela. Also part of the expedition were two of his future commanders in Lieutenant Colonel George Washington and Captain Horatio Gates. Morgan encountered difficulty the following year when taking supplies to Fort Chiswell. Having irritated a British lieutenant, Morgan was made irate when the officer struck him with the flat of his sword. In response, Morgan knocked the lieutenant out with one punch. Court-martialed, Morgan was sentenced to 500 lashes. He developed a hatred for the British Army. Two years later, Morgan joined a colonial ranger unit that was attached to the British. Morgan was badly injured while returning to Winchester from Fort Edward. Nearing Hanging Rock, he was struck in the neck during a Native American ambush; the bullet knocked out several teeth before exiting his left cheek. With the outbreak of the American Revolution after the Battles of Lexington and Concord, the Continental Congress called for the formation of ten rifle companies to aid in the Siege of Boston. In response, Virginia formed two companies and command of one was given to Morgan. He departed Winchester with his troops on July 14, 1775. Morgan's riflemen were expert marksmen who employed long rifles which were more accurate than the standard Brown Bess muskets used by the British. Later in 1775, Congress approved an invasion of Canada and tasked Brigadier General Richard Montgomery with leading the main force north from Lake Champlain. To support this effort, Colonel Benedict Arnold convinced the American commander, General George Washington, to send a second force north through the Maine wilderness to aid Montgomery. Washington gave him three rifle companies, collectively led by Morgan, to augment his force. Departing Fort Western on September 25, Morgan's men endured a brutal march north before finally joining up with Montgomery near Quebec. Attacking the city on December 31, the American column led by Montgomery halted when the general was killed early in the fighting. In the Lower Town, Arnold sustained a wound to his leg, leading Morgan to take command of their column. Pushing forward, the Americans advanced through the Lower Town and paused to await Montgomery's arrival. Unaware that Montgomery was dead, their halt allowed the defenders to recover. Morgan and many of his men were later captured by Governor Sir Guy Carleton's forces. Held as a prisoner until September 1776, Morgan was initially paroled before being formally exchanged in January 1777. After rejoining Washington, Morgan found that he had been promoted to colonel in recognition of his actions at Quebec. He was later assigned to lead the Provisional Rifle Corps, a special 500-man formation of light infantry. After conducting attacks against General Sir William Howe's forces in New Jersey during the summer, Morgan received orders to take his command north to join Major General Horatio Gates' army near Albany. Arriving on August 30, he began taking part in operations against Major General John Burgoyne's army which was advancing south from Fort Ticonderoga. Morgan's men pushed Burgoyne's Native American allies back to the main British lines. On September 19, Morgan and his command played a key role as the Battle of Saratoga began. Taking part in the engagement at Freeman's Farm, Morgan's men joined with Major Henry Dearborn's light infantry. Under pressure, his men rallied when Arnold arrived on the field and the two inflicted heavy losses on the British before retiring to Bemis Heights. On October 7, Morgan commanded the left wing of the American line as the British advanced on Bemis Heights. Again working with Dearborn, Morgan helped to defeat this attack and then led his men forward in a counterattack that saw American forces capture two key redoubts near the British camp. Increasingly isolated and lacking supplies, Burgoyne surrendered on October 17. The victory at Saratoga was the turning point of the conflict and led to the French signing the Treaty of Alliance (1778). Marching south after the triumph, Morgan and his men rejoined Washington's army on November 18 at Whitemarsh, Pennsylvania, and then entered the winter encampment at Valley Forge. Over the next several months, his command conducted scouting missions, skirmishing occasionally with the British. In June 1778, Morgan missed the Battle of Monmouth Court House when Major General Charles Lee failed to apprise him of the army's movements. Though his command did not take part in the fighting, it did pursue the retreating British and captured both prisoners and supplies. Following the battle, Morgan briefly commanded Woodford's Virginia Brigade. Eager for a command of his own, he was excited to learn that a new light infantry brigade was being formed. Morgan was largely apolitical and had never worked to cultivate a relationship with Congress. As a result, he was passed over for promotion to brigadier general and leadership of the new formation went to Brigadier General Anthony Wayne. The following year Gates was placed in command of the Southern Department and asked Morgan to join him. Morgan expressed concern that his usefulness would be limited as many militia officers in the region would outrank him and asked Gates to recommend his promotion to Congress. After learning of Gates' defeat at the Battle of Camden in August, 1780, Morgan decided to return to the field and began riding south. In Hillsborough, North Carolina, Morgan was given command of a corps of light infantry on October 2. Eleven days later, he was finally promoted to brigadier general. For much of the fall, Morgan and his men scouted the region between Charlotte and Camden, South Carolina. On December 2, command of the department passed to Major General Nathanael Greene. Increasingly pressured by Lieutenant General Lord Charles Cornwallis's forces, Greene elected to divide his army, with Morgan commanding one part, in order to give it time to rebuild after the losses incurred at Camden. While Greene withdrew north, Morgan was instructed to campaign in the South Carolina back country with the goal of building support for the cause and irritating the British. Specifically, his orders were to "to give protection to that part of the country, spirit up the people, to annoy the enemy in that quarter." Quickly recognizing Greene's strategy, Cornwallis dispatched a mixed cavalry-infantry force led by Lieutenant Colonel Banastre Tarleton after Morgan. After eluding Tarleton for three weeks, Morgan turned to confront him on January 17, 1781. Deploying his forces in a pasture area known as the Cowpens, Morgan formed his men in three lines. It was his goal to have the first two lines slow the British before withdrawing and forcing Tarleton's weakened men to attack uphill against the Continentals. Understanding the limited resolve of the militia, he requested they fire two volleys before withdrawing to the left and reforming to the rear. Once the enemy was halted, Morgan intended to counterattack. In the resulting Battle of Cowpens Morgan's plan worked and the Americans ultimately crushed Tarleton's command. Routing the enemy, Morgan won perhaps the Continental Army's most decisive tactical victory of the war. In 1790, Morgan was presented with a gold medal by Congress in recognition of his victory at Cowpens. After the war, he attempted to run for Congress in 1794. Though his initial efforts failed, he was elected in 1797 and served one term before his death in 1802. Morgan was buried in Winchester, Virginia. Morgan was considered one of the most skilled tacticians of the Continental Army. A number of statues have been erected in his honor, and in 2013 his Winchester, Virginia, home was made a designated historic place. Callahan, North. "Daniel Morgan: Ranger of the Revolution, by North Callahan." Holt, Rinehart and Winston, 1961. Higginbotham, Don. "Daniel Morgan Revolutionary Rifleman." The University of North Carolina Press, 2014.